A model of the project was made using TinkerCAD, a website that enables users to create virtual objects. Above is the latest design which includes a hand-held breathalyzer along with a gear covers, that slides over to cover the gears when high alcohol level is detected. 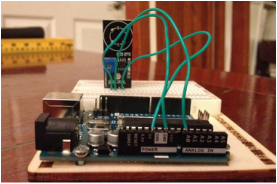 The heart of the project, made with an Arduino micro controller board, was used to code the breathalyzer. 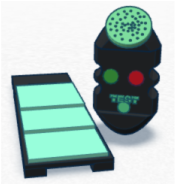 This device is the heart because it is the one testing every breath given to the tester. There is practically no life to the product without this Arduino. Our group conducted interviews on potential customers by recording their thoughts about the product. This is a crucial part of the company. We need the feedback to satisfy our customers and especially make a change in drunk driving. The Arduino board, shown in the photo, is coded to the computer to show the amount of alcohol detected using a combination of chemicals. The alcohol in the air burns into acetic acid and water, and it releases an electric current. The more alcohol molecules there are, the more current the device will pick up.​ Because of this current change, we get the different values from the sensor, which has been coded to light a red or green light based on the value that it receives. . The video on the right shows a test of the product.